We are proud to announce the debut of our 1st 3D printer model, the CreativeBot Duo featuring the best cost-to-volume & feature ratio of any other 3D printer to date! The Duo was first conceived about two years ago out of frustration for the current state, performance, and pricing of large-format 3D printers. We set out to shake things up by creating a 3D printer that would be disruptive in feature and pricing, to provide users an option beyond what the market has had to offer thus far which are expensive, underperforming printers with limited capabilities. At Creative 3D Technologies, we feel that quality and precision shouldn’t be sacrificed for ease-of-use or build volume. The Duo was designed to feature both large volume and accuracy while maintaining reliability, usability, quality, and accessibility. This combination results in a 3D printer that’s more capable than what’s currently available. Personalization and adaptability are crucial in the fast-paced world of 3D printing. The Duo has been designed not only for today’s modern user but also to be ready for whatever the future may yield. 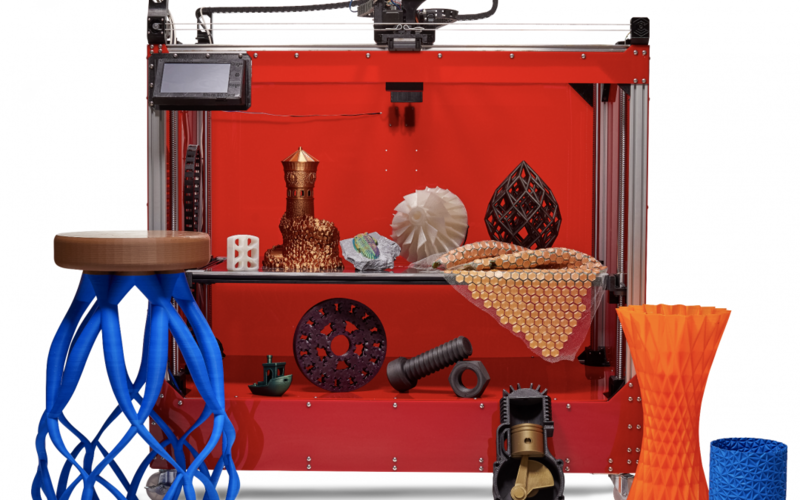 Its modularity readies the Duo for whatever direction the 3D printing industry may take! To put it simply, the Duo can stay relevant. The Independent Dual Extrusion System also adds to the printer’s capabilities. It allows the Duo to create more 3D prints or more complex 3D prints in less time. The Duo’s mirror mode allows you to create a print and its mirror image simultaneously. In ditto mode, you can print duplicate parts with ease. Its dual process extrusion mode allows you to print more complex models with a variety of different material and color options. The creative and industrial possibilities of having this system are endless! The Duo is also the world’s first 3D printer to combine a independent dual extrusion with such a large print volume. The Duo features a build volume of greater than 10.5 cubic feet without compromising precision. In fact, the Duo supports layer resolutions as fine as 30 micron and movement resolutions with 16 times the precision of most other FFF 3D printers. The Duo is equipped with a full metal build platform for fast heating that connects to Geckotech Build Plates, which are flexible plates that can adhere to and release all common print materials effortlessly when cool. A 32-bit controller with a built-in responsive web and touchscreen interfaces makes controlling your printer simple. Genuine E3D Hotends makes the precise extrusion of materials a breeze. Regarding linear movement, we use genuine Hiwin linear guide rails for smooth movements. On the Z-axis we use ball screws, eliminating backlash in Z-axis movements. These are only a few of the many other features that will make any user’s experience more reliable, convenient, and efficient.